Rio Grande Valley Vipers' RJ Hunter (3) attempts a basket against the Agua Caliente Clippers' LaDontae Henton (15) in a NBA D-League game at State Farm Arena Thursday, Dec 14, 2017, in Hidalgo. 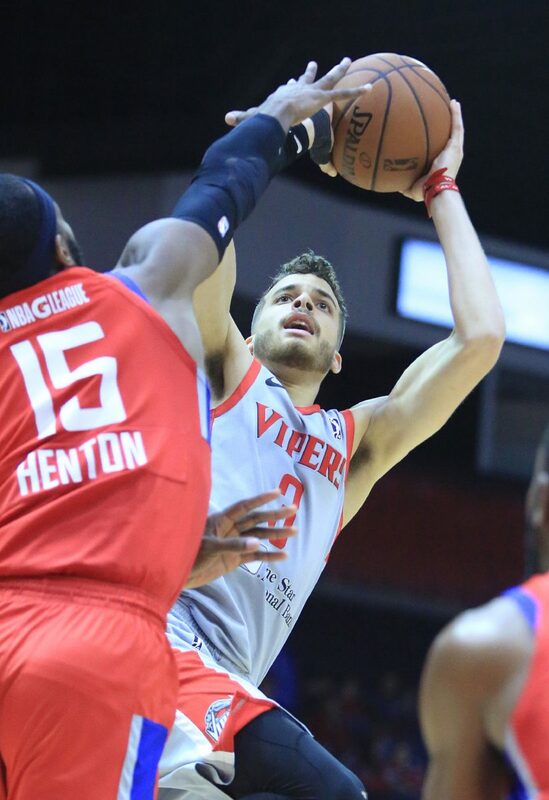 EDINBURG — When the RGV Vipers built the best record in the G League behind a 13-game win streak, R.J. Hunter was at the center of the surge, leading the team in scoring. Three months later, Hunter still leads the Vipers with 19.9 points per game on the season, but almost everything around him is different. For a variety of reasons, the team’s next nine leaders in scoring average will likely be unavailable when RGV hosts the Santa Cruz Warriors at 7 tonight at State Farm Arena in Hidalgo. Amid the yearlong roster turnover, the Vipers have gone from the top of the heap to fighting for their playoff lives, in the thick of a tense wild-card race in the Western Conference after posting a 12-17 record since the win streak. Vipers Markel Brown (15.9 points per game) and Cleanthony Early (11.5) will both be unavailable for tonight’s game due to injury, coach Matt Brase said. Isaiah Hartenstein (9.4 points, 6.6 rebounds per game) is questionable with an ankle injury, and the status Houston Rockets assignment player Zhou Qi (11.6 points, 6.5 rebounds per game) is unknown as he battles an illness in Houston. Denver Nuggets assignment player Tyler Lydon (12.6 points, 8.5 rebounds per game) has been out since undergoing surgery following a knee injury suffered Jan. 24. Nuggets two-way player Monte Morris (18.5 points, 6.7 assists per game) has been back-and-forth from RGV, most recently recalled to Denver on Monday. Former Houston Rockets assignment player Troy Williams (19.8 points, 5.9 rebounds per game) is with the New York Knicks after being cut last month, and Danuel House (17.7 points, 6.3 rebounds per game) played 15 games with the Vipers before signing a two-way contract with the Phoenix Suns in December. Briante Weber and Demetrius Jackson, the Rockets’ two-way players to start the season, parted ways with the organization in January. Weber (18.2 points, 7.4 assists, 6.4 rebounds per game) was waived and now plays for the G League’s Sioux Falls Skyforce, while Jackson (15.7 points, 4.2 assists per game) saw his contract terminated before he signed a two-way deal with the Philadelphia 76ers. Brase said the Vipers have been impacted by fatigue in recent games as a result of the lack of roster depth. Players have also been shuffled into different roles, with 6-foot-5 guard Hunter and 6-foot-2 guard Kevin Hardy shifted to power forward, on occasion. Though the Vipers’ “positionless” offense is essentially unchanged, Brase said, the team has adjusted to a more aggressive, switching defense to combat the lack of size on the overhauled roster. With five games remaining, the Vipers (25-20) are in line to receive one of three wild-card berths in the Western Conference. RGV is a nearly insurmountable four games behind the Austin Spurs (29-16) in the Southwest Division. The wild-card battle also includes the Texas Legends (26-20), Reno Bighorns (25-20), Oklahoma City Blue (25-21) and Sioux Falls Skyforce (25-21), with RGV’s opponent tonight, Santa Cruz, on the fringe of contention at 22-23. Either Oklahoma City or Sioux Falls will advance to the playoffs as the Midwest Division champion, while the other will factor in the wild-card mix. The Vipers have the advantage of playing four of their final five games at home. After hosting Santa Cruz tonight, RGV welcomes the Salt Lake City Stars on Monday and Wednesday. The regular season closes with a pair of games that could have major wild-card implications: at Texas on March 23 and home against Oklahoma City on March 24. Wroten said the Vipers are ready to come out like a “whole new team” — one on the level of the group that won 13 straight early in the year.